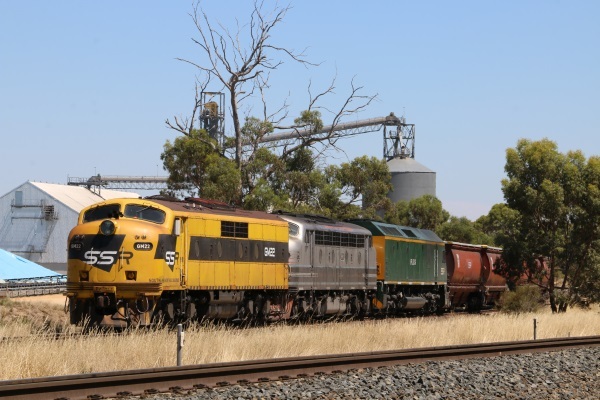 The coming year promises to be an interesting one on the rails of western Victoria, with a significant quantities of grain to be moved and the impending opening of the Ararat to Maryborough line and the start of operations on the regauged Mildura line. Although the transport of mineral sands from Hopetoun to Hamilton came to an end early in November last year which has removed one regular service, up to four operators will be engaging in the grain task in 2018. Late last year Southern Shorthaul Railroad began operating grain services on the western standard gauge on both the main line and the branches. Locomotives RL302 and RL306 have provided the big power and smaller units including GM22, GM27 and B61 have assisted on the main line and led the trains on the secondary lines. Above - SSR grain service 9733V fronted by GM22-B61-RL306 prepare to leave the Dimboola Grainflow Centre around midday on Tues.16.1.2018. Qube commenced trips between Dimboola and Portland early in January and has also loaded at Nhill. Motive power employed has been exclusively CM3313 and CM3315 on hire from CFCLA. Pacific National continue to be a regular in the grain haulage task utilising pairs from the BL, G and 81 classes and loading at all active GrainCorp sites and GrainFlow at Dimboola. This operator has also run a number of trains from New South Wales to load at the Maramalake terminal at Murtoa and return. Genesee & Wyoming Australia (GWA) also travelled from South Australia late in 2017 on a few occasions to load grain at Dimboola. The main action on the reopening of the Ararat to Maryborough line has been the two ballast trains based out of Ararat and Avoca respectively. The first of these is being hauled by locomotives 8037-GML10 and 8044 whilst the second one features 852 and 4836 which were trucked from Ararat to Avoca to begin work on this isolated section of standard gauge track. In addition to grain and ballast trains, the usual assortment of intermodal and steel trains will be plying the rails between Melbourne and Adelaide and locations beyond. Of particular interest is the SCT operated intermodal services between the Wimmera Intermodal Freight Terminal at Dooen, east of Horsham, and the docks in Melbourne. These services are regularly hauled by combination of SCT, CSR and hired VL class locomotives.